Whether you’re short of time, struggling with young kids, carrying bulky sports equipment or simply want to add some VIP to your trip, Ace Meet and Greet Parking is the perfect solution for arrive-and-fly airport travel. Simply drive straight to the terminal. No need for a transfer - just walk straight into the nearby terminal. After dropping your car with one of the Ace drivers, it will be taken to a nearby car park, employing modern security systems and CCTV. The meet and greet service is ideal for passengers requiring any extra assistance. Ace cannot accept the following makes of cars for insurance premium reasons: Aston Martin, Ferrari, Rolls-Royce, Bentley or Maserati. No trailers and vehicles must fit in a standard parking space (2.4m x 4.8m). If you have a specially adapted vehicle please contact our call centre to check if it can be accommodated. If you are to return early from your travels, you must call ACE ASAP. 24hrs minimum is required to inform ACE. Please call 0121 272 7799 (option 1) when you are 15 minutes from the airport. When you arrive at Birmingham International Airport, stay in the right-hand lane and follow it all the way to 'Valet Parking'. Go through the barrier and collect a ticket to hand to ACE Parking Chauffeur. Park your vehicle in the designated ACE Parking bays and a uniformed chauffeur with ID will be there to collect your vehicle. 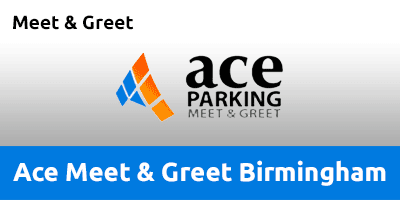 Please call Ace Parking on 01212 727 799 (select option 1) 15 minutes prior to your arrival at Birmingham Airport. Please have ready your 'Booking Name' and 'Booking Reference' when you call and we will dispatch our driver to meet you. Follow the directions below to the meeting point at the terminal. Please allow sufficient time for our driver to complete our check-in procedure and conduct the necessary photographic vehicle inspection on your arrival. This usually takes 3-4 minutes. Failure to leave adequate time for our driver to complete this may relinquish any claim for damage not recorded as a result. If you are running late this can be completed by our driver after you have left but always before he or she moves your car. Once You have collected you luggage, Please Call ACE Parking on 01212 727 799 option 1. As you exit the terminal building, follow the signs to Valet Parking (where you dropped the car off). Your vehicle will be returned to the designated ACE Parking bays. A uniformed chauffeur will return your vehicle. Please be aware that due to time restrictions in the car park you must be at the collection point within 10 minutes of your call, or you may incur additional charges payable at the exit barrier. If you are returning earlier than the date or time you have provided, we must know 24 hours in advance to avoid any delay.